Tuesday started out as a typical day. I got up, turned on my computer, but then things took a bit of a turn when I saw that the Oscar nominations were due at any time. I was too anxious to put off finding out the news until after work, so I waited to watch the list aired live on TV. I usually build some procrastination time into my morning routine for instances like this, and always set my alarm a little early. In a perfect world, it would be my job to be reporting on this breaking news straight from Park City (as Sundance is going on right now) or Hollywood. Then the Coen Brothers would be waiting in line for me to talk about their next project and James Franco would share all his thoughts about hosting the big show between being a famous actor, going to school, and writing books. I’ve got to start somewhere, so here are some predictions about which nominees could win and those that actually should. I am only three films away from clearing out the best picture list, and need to see 127 Hours, The King’s Speech and Toy Story 3. I’d also like to check out Winter’s Bone again, and my preference would be for True Grit to take home the award. I liked The Social Network overall and given all the hype it will probably be between that and The King’s Speech. The third runner up will probably be The Kids are All Right. Inception should be up there, but will get robbed of the award. And, The Fighter should be more of a contender than it probably will be. Just writing about this, the anticipation of waiting for the envelope to open during the Oscars is setting in. I am not sure where Black Swan will fit in, but think it or Winter’s Bone would be the surprise award winners of the night. I rank the 10 films, as far as their likelihood to win, as 10) Toy Story 3; 9) Inception; 8) 127 Hours; 7) The Fighter; 6) Winter’s Bone; 5) Black Swan; 4) The Kids are All Right; 3) True Grit; 2) The King’s Speech; 1) The Social Network. I am overall pleased with the actor and actress nods, but think Matt Damon should be in the supporting role ranks for True Grit. Get Low didn’t get any mention by the Academy and Robert Duvall should be in the best actor category for his performance. As with best picture, I think best actor will be between The Social Network with Jesse Eisenberg and The King’s Speech with Colin Firth. I’d like it to go to Jeff Bridges for True Grit or, from what I’ve heard about 127 Hours, James Franco.I just don’t think Eisenberg’s career is seasoned enough for him to be deserving of the Oscar and his Social Network role doesn’t set him above the rest. Lead actress will, and should go to Natalie Portman for Black Swan. My second choice would be Nicole Kidman for Rabbit Hole. I’ve read about the extensive process and time it took to make Blue Valentine, so Michelle Williams is deserving even thought I haven’t seen her work. I expect the trend will continue from the Golden Globes with Christian Bale taking home the statue for best supporting actor for The Fighter. Hailee Steinfeld is most deserving in the supporting actress category. The only other film I’ve seen of actresses in the category is The Fighter and Amy Adams and Melissa Leo are nominated. I’d go with Amy Adams in that case and she is my second pick. As Oscar season continues, I also want to see Animal Kingdom, Blue Valentine and at least make my way into the foreign film category with Biutiful and to documentaries with Exit Through the Gift Shop. That rounds out the main categories, but I’ve printed my nomination list and will do as much viewing research as possible before Feb. 27. I had to remind myself not to jump up and cheer Go Micky! while in the theater watching The Fighter today. I am not a boxing fan by any means, but for some reason when Micky Ward (Mark Wahlberg) was in the ring winning fights, I wanted to be there cheering right along with the crowd and his family. Especially in the last scene. Throw in that song from The Heavy and it was like “Oh my God, oh my God the Indians win it, the Indians win it!” from Major League. The Fighter is a pretty simple story and very respectable since it is based on the real lives of boxing brothers Micky Ward and Dicky Eklund (Christian Bale). I spent a lot of time thinking about the relationship between the brothers while watching the film. Dicky is toxic for Micky at times, but he is also his hero. I wondered if that heroism would rise above Dicky’s faults, but how could it not? Micky’s got his faults too and while he said he couldn’t continue on and work with his brother, they’re family, and that’s most important. All the characters in this story have a love-hate relationship, really. They may seem to want what is best for themselves, but in reality they want what’s best for the person closest to them. Micky and Dicky want success for each other. Family matriarch Alice Ward (Melissa Leo) would throw a punch or two for her sons, but in the end sets aside trying to be Micky’s manager to really be his mother. Micky’s girlfriend Charlene (Amy Adams) was just right. She was ringside all the time, but never let her own motives get entirely in the way of supporting Micky and eventually his family. Her role exemplified that beneath the dysfunctional surface of Micky’s family was true support and love. She gives it all up temporarily, but Dicky brings her back. All for his brother. Everyone is there who should be at Micky’s fight for the boxing title. You’ll walk away with a win if you choose to see The Fighter. Maybe you won’t feel like jumping out of your seat, but you’ll know what I’m talking about. Speaking of crushes, Parks and Recreation does incorporate romance, but not to the level where an hour of air time would be dedicated to a wedding. I did love the Jim and Pam Office wedding episode, don’t get me wrong, but there is something to be said for Parks and Recreation’s more subtle approach to couples. Will Leslie end up back with Mark? Will Louis CK’s character return? 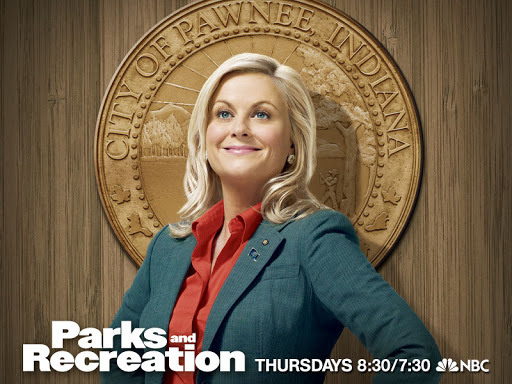 Parks and Recreation has a very “who cares, it’s a comedy!” approach to these burning questions. I am not finished with season two yet, and I am happy that when I do there will be some of season three there waiting for me on DVR. Check it out, pick your favorite character and don’t get behind like I did! This one’s a keeper. You know, for some reason Country Strong has grown on me since I saw it a week ago. The appeal for me to see it was Gwyneth Paltrow’s performance and her own singing as country star Kelly Canter. Paltrow’s performance met my expectations and I was surprised by where the writer and director took her character, but didn’t always enjoy that aspect of the plot. The director pushed Canter’s hot mess situation a little too far in some scenes. I was also surprised that Country Strong is much more of a drama than a feel-good feature. The previews for this film are a little deceiving. Some of the previews I saw on TV seemed to focus more on the younger country stars in the film, played by Garrett Hedlund and Leighton Meester — maybe to draw in a younger audience. They are a big part of the film, but that’s not to take away from Paltrow’s performance, or the plight of her character. Tim McGraw plays Paltrow’s husband James in the movie and while I didn’t think so for The Blind Side, he shines in this one. McGraw is a musician and married to Faith Hill in real life, but he definitely went beyond just acting like himself for two hours on screen. The main downfall in Country Strong is the music. The mainstream pop-country style wasn’t enough to set the music at a level as strong as the acting. Paltrow’s got the voice for it, why didn’t they try to go to the level of Crazy Heart? Crazy Heart is a much better movie, having the similar premise of a washed up country music star, but there is a niche for both in film audiences. Go out with the girls to see Country Strong, enjoy the eye candy of Garrett Hedlund (though I kept mistaking him for Ryan Gosling) and enjoy the acting props from the cast. Then, see Crazy Heart too. Things aren’t nice, anymore. This is definitely a line that still runs through my mind a week after I saw Rabbit Hole. So, it’s barely 2011 and this is my favorite film this year. I imagine as the next 12 months go by, it will still be a contender. As depressing as this story is, the realism the writer, director and cast achieved was the tops for me. Married couple Howie and Becca lose their young son after he is hit by a car in front of their house. The characters are dealing with tragedy and grief and suffer a rift in their relationship. However, the rift doesn’t take away their love or trust and I appreciate in this story that they didn’t betray each other as punishment for losing their son. The rift is caused because Becca (Nicole Kidman) and Howie (Aaron Eckhart) choose other means of support to cope with their son’s death. Becca chooses to pack up their son’s belongings without discussing the decision with Howie. He decides it’s time to sell the house or bring back the dog their son loved so much. Becca gave the dog to her mother, Nat (Dianne Wiest) as another way to attempt to remove the grief from their home. But, it’s not possible. This story hits the viewer with the fact that bad things happen and people just have to find ways to live with them. Grief doesn’t go away, so how can Becca and Howie live with it? Things were nice for Becca and Howie before, and now they’re not. Visually, since Rabbit Hole is based on a play, I noticed that the screen version resembles the intimacy of seeing something on stage. It is especially evident in scenes just between two people, Becca and Howie, Becca and her mom, or the boy who hit Danny with his car. Becca actually bonds with the teenager, who is dealing with his own grief for accidentally killing Danny. The realism of Rabbit Hole also allows the viewer to place themselves right into the plot. Would I have the same experience as Becca and Howie if I were in their shoes? Yes. Could I see myself relating to a person who killed my son? Yes. Maybe not in my own real life with people I actually know, but this story is told in such a believable way, I get it and I’m there. We’re all human. Better to live showing your real feelings than pretending to be happy. Again, it’s a completely depressing, but eye-opening film. The characters of Becca and Howie don’t end up happy, but they’re at peace. The same is true for me as a viewer. I’m at peace with this portrayal of a sad, sad story. It’s not something any moviegoer could possibly be in the mood for, but if you’re going to go there, watch Rabbit Hole. I managed to contain myself having to wait until after the New Year to see True Grit. It was very difficult since I read about the release from the Coen Brothers most likely before production was even complete. The anticipation I had was met with my continued admiration for the Coens and their cast after seeing the film on Sunday. 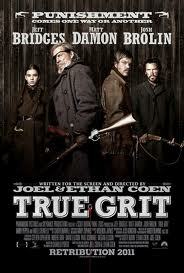 Their version of True Grit is based on the book of the same title and stars Matt Damon, Jeff Bridges and Josh Brolin. The story of 14-year-old Mattie Ross (Hailee Steinfeld) and her mission to track down her father’s killer and bring him to justice builds slowly. The technique in the writing brings more authenticity and interest to her interaction and ultimate bond with U.S. Marshal Rooster Cogburn (Bridges) and Texas Ranger LaBoeuf (Damon). As they venture out in search of outlaw Tom Chaney (Brolin), the tale develops more as one of the hero characters surviving together than the villains taking over with their evil power (as with Anton Chigurh in No Country for Old Men). Mattie Ross does have a vengeance to track Chaney and LaBoeuf and Cogburn have their reasons too. It’s their job and they want the money. Each character is a hero in his or her own right and not in ways you would expect. Cogburn cares for Ross more than a man with such a hard shell would let on and when she becomes the one in a close encounter with Chaney before anyone else, it wasn’t an expected plot twist. The presence of LaBoeuf’s character weaves in and out of the storyline, but I knew he would always show up again and (to add to my admiration of Matt Damon — even as a fictional character) save the day. He manages to do so even with a bit of an accident prone curse and Cogburn can do it all even after drinking a pint of whiskey. Cogburn can only see out of one eye and LaBoeuf is dragged by a horse and bites off part of his tongue. (Matt Damon explained in an interview that he wrapped a rubber band around his tongue to perfect the Texas Ranger’s lisp). In addition to their own weaknesses, the trio encounters the dangerous gang that rides with Chaney, bad weather, snakes (a terrifying scene for me especially) and gunfights. Most of all True Grit is an adventure each of the characters needed to take to grow apart as much as it brought them together. While Chaney seems to be the motive behind all their travels, he actually plays a very small role. Even if your expectations of True Grit were completely opposite of mine, it won’t disappoint. People in the theater laughed, gasped (oh gosh, the snake scene!) and in their silence I like to think they were in awe, just like me. Well done, Coen Brothers, well done.